Jim Peters lives near Puget Sound in Washington, and during fishing season his kids eat smoked salmon like candy. Peters is a council member of the Squaxin Island Tribe of South Puget Sound. Fish permeate nearly every aspect of their culture; in the 1850s tribal members gave up most of their land to settlers in treaties, but refused to sign away their fisheries. As a big fish eater, Peters is concerned about toxic pollutants like mercury that accumulate as they move up the food chan. He's not worried only for the sake of his kids or the region's tribal members, but for everyone who considers eating locally-caught fish or seafood a way of life because for decades, water quality regulations of Pacific Northwest states haven't adequately protected people who consumre large quantities of fish. That's slowly beginning to change, but for many tribes in the region it's long overdue. Oregon finally revised its water quality regulations in 2011 to reflect the diets of people from the Umatilla Tribe, as well as Asian Americans, Pacific Islanders and avid anglers, all of whom eat a lot of fish. That set off a domino effect in the region, and now Washington and Idaho are overhauling their outdated water quality rules to make sure it's safe to eat larger quantities of fish from local waters. But even though states are finally making regulatory progress, changes to water quality will probably come slowly, due in part to the difficulty of controlling runoff, storm water and other discharges that don't come from a pipe or canal. For anyone consuming large quantities of fish, one of the greatest risks comes from methylmercury, which builds up in the fat of carnivorous fish like salmon. Mercury poisoning can lead to vision loss and other neurological problems, and can cause severe developmental damage to infants exposed in the womb. Most mercury is deposited into water from the air, with coal-fired power plants, smelters and waste incinerators as major sources. The Clean Water Act determined how much mercury could be in the water without posing a significant risk to human health, and set a limit at that concentration. That limit takes into account how much fish people eat: the more fish consumed that contain mercury and other toxic chemicals, the higher the risk of getting sick. After a nationwide survey in the 1980s, the EPA set the fish consumption rate at 6.5 grams per day, and many states incorporated that rate into their water quality standards. But in 2000, the agency upgraded that Ritz cracker-sized amount to 17.5 grams per day based on a new survey showing that people were eating more fish. When states review their water quality standards, as they should every three years under the Clean Water Act, they can adopt the new rate unless they have better data available on the diets of their residents. However, quite a few states still use the old recommendation of 6.5 grams per day -- including Peters' home state of Washington. 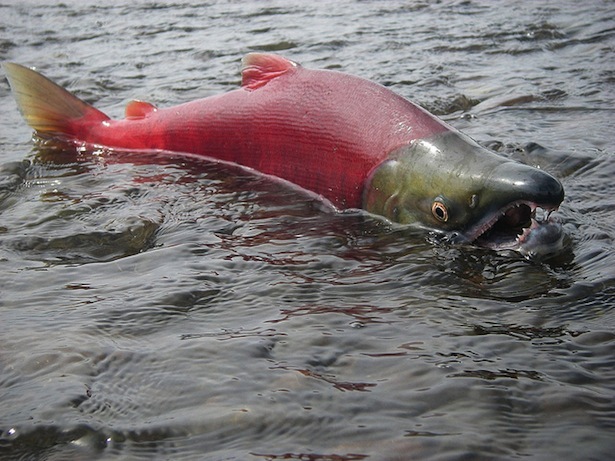 But now that Washington is finally updating its water quality standards, officials are looking at regional fish consumption data, including a 1990s survey of the fish and shellfish eating habits of the Umatilla, Warm Springs, Nez Perce and Yakama tribes in the Pacific Northwest. That survey found that a rate of 176 grams per day would protect 95 percent of the people surveyed. In 2011, Oregon used that same data when it upped its fish consumption rate to 175 grams (or about six ounces) per day, making its human health criteria ten times stricter than the EPA's. Washington seems likely to use that as a precedent, and EPA is now forcing Idaho to adopt a stricter standard, too. Last year, the agency shot down Idaho's newly proposed rate of 17.5 grams per day, arguing it wasn't enough to protect members of the Nez Perce tribe. Idaho is now planning to survey its residents on how much fish they eat from state waters. Even once all three states have fish consumption rates that protect most of their residents, it will take time for those rules to take effect. For example, Oregon isn't expecting dischargers to comply right away, because in some cases the technology to reduce pollutants by ten-fold doesn't exist yet. Non-point source pollution, like agricultural or logging road run-off, also poses a serious challenge to water quality because it's much more difficult to regulate than, say, a wastewater treatment plant. "We need to find the source of the problem," says Joel Moffett, the vice chairman of the Columbia River Intertribal Fish Commission. "The water issues are not just from these large corporations and industries that have to get permits." So will higher fish consumption rates and stricter standards lead to better water quality? "That is the objective," said Andrea Matzke, who is involved in implementing Oregon's new standards, noting that it's the question everyone has been asking. But it's going to take time. And without major changes to the way we manage our watersheds as a whole, living off of fish may never be risk free.